So... sign no one if they are not a 3* and just go with what we have? Right... Brilliant! That is the BEST way to get better. Just don't sign anyone that is not a 3* because we have the best of the best in Sun Belt. You don't like the signee... WE GET IT. Don't like coach, WE GET IT. Want to complain go ahead. Doesn't change we'll be going to play this season with THIS team. I for one will like to support the players putting in the work. There is a wide gap in between a 3* and a JUCO who only has a bad FCS and a bad D2 offer. Do the legwork: go look at all of the other commits/signees from Sun Belt schools and those Texas State should be recruiting against (North Texas, UTEP, etc.). Hell, check out Sam Houston State, Lamar, Abilene Christian, Stephen F Austin . . . see how many guys they sign who only have one bad FCS and one bad D2. There are plenty of guys in between a 3* before hitting rock bottom. Year three rock fragments are flying. Year three rock fragments are flying. cattaneo signed in fran's 5th year at txst, his 20th as an fbs head coach. At this point I don’t care about ratings or offers. I just would like people actually at the OL. Both Pesa Tupa and Anthony Mayes had FBS offers but neither of them made it to fall camp. Hell, had Marshall Levins not flipped his commit, he wouldn’t have been academically eligible, either. It's two months past signing day. We're not gonna sign any quality 2018 recruits at this point cause there aren't any left unsigned. I'd like to know why we weren't able to sign a full allotment on signing day, but signing what we can now is better than nothing at this point. As for sun belt rankings our 2018 class is ranked 5th and 2017 class was ranked 1st. -Blinn College 6'1/210 qualifier... not sure if we are looking at him as a safety maybe? From where I'm seeing our weak areas, its still OL, I still have concerns at TE with Rogers ACL out til August, DL with loss of Mittie and Lanza (moving Patton to DT may help balance out positions and talent lost at position), ILB (are we really good with only 4 ship guys and possibly a 5th?, CB/S are still young and somewhat thin just barely having at each position 6 ship players. I'd like to see with supposed 3-4 ships left in 2018 to fill another OL spot, a DL spot, a CB/S spot, and maybe a TE spot. Likely won't be all 4 positions but right now it sure looks like DB will be 1 or possibly 2 spots. I'll say this if our plan was to go JC for some spots late... considering last season's signing of 2 JC OL and neither made it (1 physical health and other grades)... I'm not sure I'd offer until there were more concrete they were going to pass/graduate to come to TXST. We don't have the room for error and last year we lost out on 2 ships due to this. Keff reporting OL transfer from Central Ark as a PWO. 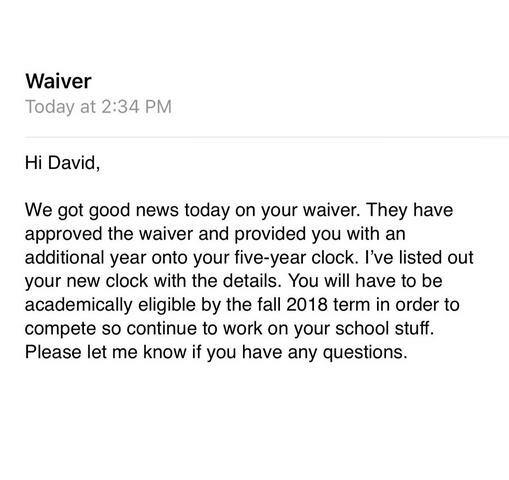 looks like he just got granted another year of eligibility. his twitter bio says he's a dt now? Well, I'll say this... we have a ton of PWO size on DL from Tachie at 295 (if true the move to DL) and Onyirioha at 283, and Seth Burge at 265 to name a few. Not sure any will earn a ship but not a bad thing to have some size. Would like to see some of this size develop into some good use. I did not see where it says he moved to DT. I know nothing about twitter though. Are you confusing his initials of DT as defensive tackle or is there something I am not looking at? Tachie already sat out. He was on the rooster last year. Which should mean he is eligible to play this year. He was listed 313Lb last year. Tachie is currently practicing as LT with the twos during Spring ball. Any other info Pieeaters? Thanks in advance. Would like to hear as much about where players are taking reps.
No. Do you really think the top-ranked Sun Belt class had a quarter of their signees with a combined one FBS offer? At least two of those signees stopped their recruiting early and wouldn't field calls from other schools. At least two of them had more offers than you've claimed for them. Just because a kid doesn't announce his offer on Twitter (where 247 gets a lot of their initial info) doesn't mean the offers don't exist.